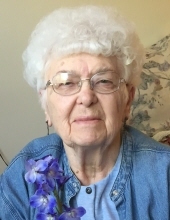 June K. Edwards, 92, of Pontiac, IL, formerly of Chatsworth passed away at 4:57 am on Wednesday, January 16, 2019 at Good Samaritan Home in Pontiac, IL. Private family services will take place at Chatsworth Cemetery. In lieu of flowers, memorial contributions may be made to Baltz Library of Chatsworth Township, 501 East School Street, Chatsworth, IL 60921. Calvert & Martin Funeral Home in Chatsworth is handling arrangements for the family. She was born in Melvin, IA a daughter of Richard and Martha (Wiechert) Saienga. She married Floyd "Lum" Edwards on October 1, 1946 in Chatsworth, IL. He passed away on July 30, 1994. June is survived by many nieces and nephews. Her parents and husband preceded in death. She was a member of the Chatsworth United Methodist Church. "Email Address" would like to share the life celebration of June K Edwards. Click on the "link" to go to share a favorite memory or leave a condolence message for the family.